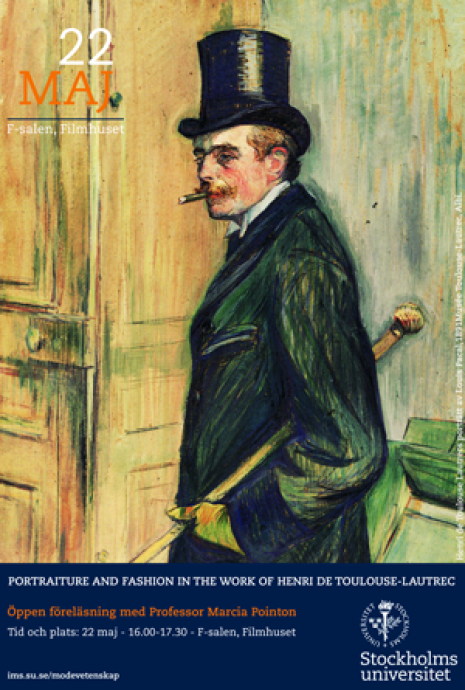 The Centre for Fashion Studies welcomes you to the first open lecture this spring which will focus on a selection of Henri de Toulouse-Lautrec's works and place them in the context of the history of portraiture. Marcia Pointon is Professor Emeritus in History of Art at the University of Manchester, and Hon. Research Fellow at the Courtauld Institute of Art. Her books include Hanging the Head: Portraiture and Social Formation in Eighteenth-century England (1993), Strategies for Showing: Women, Possession and Representation in English Visual Culture 1665-1800 (1997) and Brilliant Effect: a Cultural History of Gem Stones and Jewellery, published in 2009 by Yale University Press. She has also published many articles, contributions to collections and exhibition catalogues, and research papers on topics ranging from collecting and patronage, landscape, gender studies, to problems in methodology, the body in representation, childhood, and portraiture as most widely understood. Her latest book: Portrayal: the Search for Identity was published in January 2013 by Reaktion Books.